Are your thighs parallel to the ground with your feet flat? If yes, great! With your feet flat and your legs parallel to the floor, that will allow for maximum circulation to get to your feet and lower extremities. Additionally posture begins with your feet and if your feet are flat and legs at ninety degrees, that will encourage good posture the rest of the way up your back. If no, lower your chair to a height that allows for your feet to be flat on the ground, a ninety degree bend in your knees, and your thighs parallel to the ground (your knees are not lower than your thighs). If you are not able to lower your chair, a footrest could be an option. With your feet flat and your knees at ninety degrees, are you sitting all the way back in your chair? If yes, this is the ideal position to be in. Sitting all the way back will allow you to fully use the back support of your chair and improve your posture while working at your workspace. 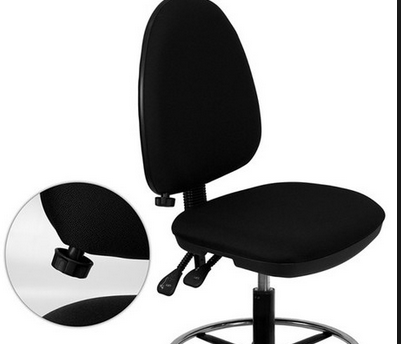 If no, be sure to scoot all the way back in your chair and do not sit on the edge of your chair. When sitting all the way back, is there at least 2-3 inches between the back of your legs and the edge of the chair? If yes, good. There should be some space between the back of your legs and the edge of your chair so that you are not deterred from sitting all the way back. If no, some chairs allow for the seat pan (the part you sit on) to be adjusted and can slide back and forth to adjust the depth of the seat. If your chair has this adjustment it will be underneath the seat pan. If your chair does not have this option, and the seat pan is hitting or digging into the back of your legs, and even preventing you from being able to sit all the way back in your chair, your chair may be too big for you. If your chair is digging into the back of your legs, it may be causing you to sit on the edge of your seat or it may reduce circulation to your lower legs. When sitting all the way back in your chair is the lumbar support hitting you in your lower back? If yes, that is best. That encouragement from the lumbar support will allow your spine to bend naturally and encourage your shoulders to stay back and reduce hunching forward. 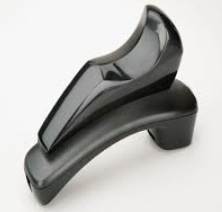 If no, adjust your lumbar support up or down until it rests where your lower back naturally curves inward. If you’re not sure where that natural curve is, sometimes it can be helpful to stand up and run your hand along your back until you feel it curve in before it curves back out. 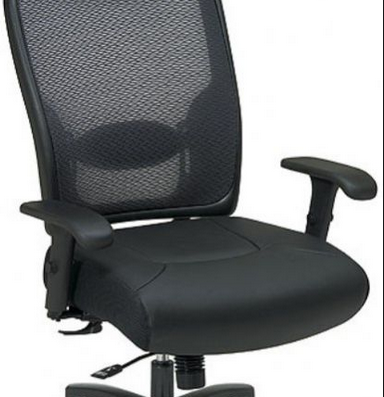 while others have a lumbar that slides separate from the back of the chair. 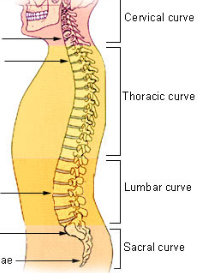 When correctly adjusted, the lumbar support should encourage the curve of your spine. Now that you have adjusted your seat, pull up to your keyboard. When typing at your keyboard, are your shoulders pulled back and arms at your sides? If yes, that’s good. When you’re typing, ideally the only thing that should be moving is your fingers. Your shoulders should be pulled back and your arms should be at your sides. You should not be using your entire arms when typing. If no, you may be sitting too far away from your work space. 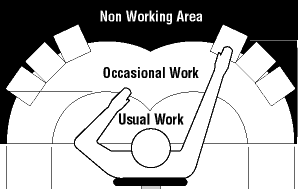 Pull up close enough to your work space so that your shoulders are pulled back and your upper arms are resting at your sides perpendicular (or close to perpendicular) to the floor. You may also need to move your keyboard closer to you. Keep your arms close to your sides to avoid reaching out and straining your shoulders, arms and neck. When using your mouse, are your shoulders pulled back and arms at your sides? If yes, that’s great! Your shoulders should be pulled back and your arms should be at your sides. You should not be using your entire arm when using your mouse. If no, again, pull up close enough or adjust your mouse so that is it close enough to you that you can use your mouse while keeping your shoulders pulled back and your upper arms at your sides. Your elbows should stay close to your torso. Is your mouse located as close to your keyboard as possible? If yes, good. That will reduce the work that your arm has to do during the day. If no, consider moving your mouse closer. 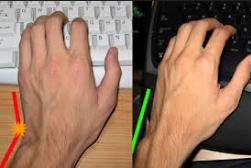 Having to constantly reach from your keyboard to your mouse, if they are far away, can overwork your mouse arm and hand. If you are using a keyboard tray be sure your keyboard tray has space for your mouse. Are your keyboard and mouse at the same height or close to the height of your elbows? If yes, good. 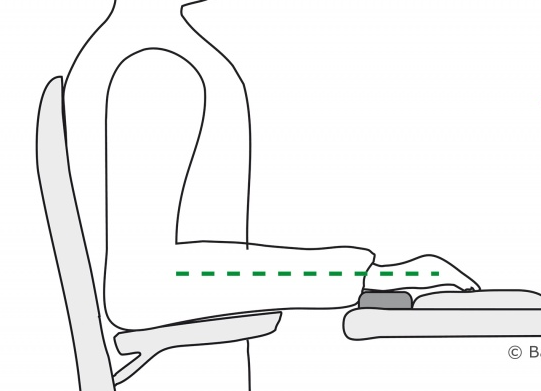 If your keyboard and mouse are at the same height that would mean that only your lower arm has to move. Your upper arm and shoulder would not have to reach or work harder than necessary. If no, there are two options. 1. Consider a keyboard tray. 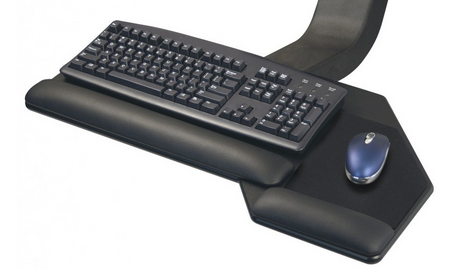 A keyboard tray would allow you to keep your chair at the correct position for your legs and feet but allow you to adjust your keyboard to the correct height for your arms. 2. The other option would be, raising your chair to the correct height for your desk top (where your desk top is at or a little below the height of your elbows) and then obtain a footrest to allow for the ninety degree bend at your knees. When typing, do you have a neutral wrist? If yes, that is best for your wrists and hands. A neutral wrist prevents tension and pain in your wrists and hands. and would instead allow you to keep a neutral wrist while typing. When typing do you have a neutral wrist? If your wrists are bent while you are typing, make sure that your keyboard is directly in front of you and make sure that it is at the same height or close to the same height as your elbows. If your keyboard is directly in front of you and at the correct height and your wrists are still bent, an option could be an ergonomic keyboard. Is your monitor directly in front of you? Or if you have two monitors, are they directly in front of you? If yes, good. 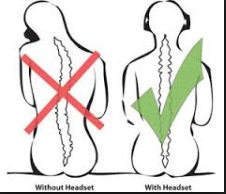 That will reduce the movement of your head and prevent you from turning at your neck constantly throughout the day. If no, move your monitor so that it is directly in front of you. With your head straight on top of your shoulders, you should be able to see all or most of the display of your monitor with limited movement in your head. 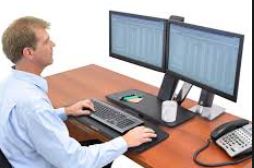 If you have more than one monitor, and you use your monitors equally, you should position your monitors so that the two monitors come together directly in front of you so that you can see from the far left end of left monitor to the far right end of the right monitor with limited or any movement in your head. Is there a glare on your screen? If yes, consider positioning your monitor differently to avoid a glare. If there’s a glare on your screen, you may squint at your screen. Squinting can cause undue eyestrain or headaches. If no, good. Your monitor is in a good position and you likely won’t have to squint in order to see the display on your screen. Is the top of your monitor at eye level? If yes, that is the best position for your monitor. It will prevent you from craning your neck and tilting your head back in order to look up to your monitor. 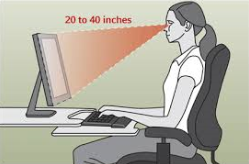 If no, adjust your monitor so that when you are sitting all the way back in your chair with your shoulders pulled back, the top of the screen is directly at eye level. Most monitors are able to slide up and down along the back support. If yours does not move up and down, you could raise it by placing books or reams of paper underneath your monitor. Are the items that you frequently use all within reach? If yes, that’s the best practice. Everything within reach prevents having to over reach. If you do have to reach for something far away that you use infrequently, be sure to stand up and use both hands if necessary so you don’t strain your back or arms. If no, move items such as phones, adding machines, calculators, are within reach. Do you spend much time on the phone? If yes, consider a cradle for your phone for added support. Another option could be a headset to prevent you from craning your neck if you spend a lot of time on the phone. Also, be mindful of not overworking one arm. For example, if you use your phone frequently, place it on the other side of you than your mouse. That way if you use your mouse all day with your left hand, your phone on your right hand side would balance the work between both arms. If no, be aware that there are ergonomic options for phones, but if you don’t spend much time on the phone, those adjustments might not be necessary. Do you get up and move every 20 minutes? If yes, that’s great! You should keep doing what you’re doing. If no, consider adjusting your routine to try to get up and move every 20 minutes, even if it’s just for 30 seconds or one minute. Increased movement in the day encourages circulation and can reduce tension. To help remind yourself to get up and move, you could place a post it on your monitor as a reminder, or set a calendar invite using your Outlook calendar. When the invite pops up, you could hit “snooze” and snooze the reminder for 15 or 30 minutes to help remind you. If there are questions about proper work station adjustment, posture, or physical concerns, please feel free to contact Human Resource Management (HRM) at hrdept@ku.edu or 785-864-4946. We can schedule a time to check your work station, if desired. If you have any questions or need additional information, please feel free to contact HRM at hrdept@ku.edu or 785-864-4946.